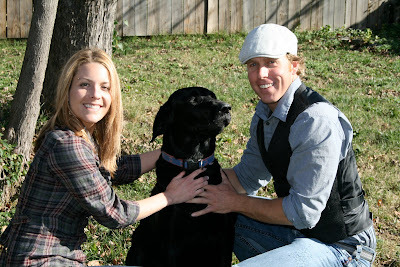 This is one of the engagement pics with their "baby" Smokey. 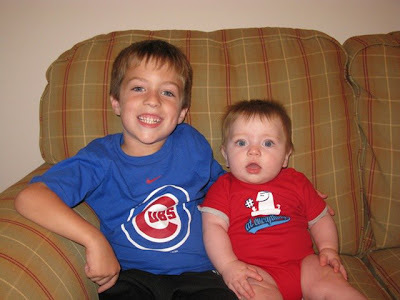 And, below--the loves of my life: Hank & his little brother Mack. They have moved back to town & live within 4 miles of us, so anytime the phone rings and Hank wants to see me---well, need I even say it????? Where does the time go? Have you noticed the days spin so quickly that suddenly it's July 4 and then it's later???? Catering has been going so well. We feel that God has really had his hand on this venture. Even as the economy slowed to the pace of a snail on valium, the orders still came. The work has been consistant. We even have 2 employees & I have to tell ya---it sure has made a difference in my days. Oh, we still work 12 & 14 hour days, 7 days a week, but I have them to help me bear up under the load! One of these days I'll try to get some of my recent cakes on the blog. As of right now, they are stored on the home computer & I'm sitting at the kitchen waiting for potatoes to boil. Random thought--I have to really watch my attitude when I get bone tired. That's when the pity parties begin! Just the other day I was whining to myself things such as "I have a terrible headache" " My arthritis is killing me this week" and so forth. And would you believe, I began to think about my Aunt Dora Ann--whom I haven't thought about in years! Aunt Dora Ann had rhuematoid arthritis and died from complications of that illness at age 48, and that was a good 25 years ago. But one thing Aunt Dora Ann never, ever, EVER did was complain or think of herself! She had 6 children and she continued to sew for them & cook for them even when she was confined to a wheel chair. And as I was lamenting my aches & pains, I realized that Aunt Dora Ann would LOVE, I mean "jump up and down" love to trade places with me. Always with a smile on her dear face and a twinkle in her eyes, she would come here and visit her kids, the grandkids she never saw, hug her husband--the love of her live, and bear up under any pain to be with them for a bit. So, complaining--whining--boo-hooing life's challenges--BE GONE! I shall take life by the reigns & find the wonder in each day. If I am hurting from working the fingers to much I will give thanks! I am here and have the ability to do so. And those hurting hands can still touch the faces of my little Hank & Mack. Life is what you want from it. Attitude is 90% of the journey. Bitterness and hatred settle into the bones and leach the life, leaving only pain and sorrow. Joyfullness and child like wonder rejuvenate the spirit and add years of life. Ok, so much for the random thought. It's just what happened to zip through the mind. Anyhoo--hope all are enjoying life! Hey blogfriends! It's been a wild ride around here. New grandson on Dec 3, hubby had stroke on Jan 8, son married on Jan 30 & shoulder surgery on Feb 18. Whew--all that and a catering kitchen to run. But, it's amazing what one can do when pushed. I have discovered that I can function with one good arm & one in a sling. I kind of resemble a Tyranasorus Rex--two arms held up to the chest. I'm thinking I'd make a good comedy sketch! I have learned that I CAN frost & decorate a full sized sheet cake, pull homemade rolls, roll out dough, and on and on with this "handicap". It's all between the ears--what you determine. My jonquils are blooming--I think what I like best about them is their determination. It's been cold, rainy, cloudy, and yet they stick out their little yellow heads to see what's going on in the world. And the color they add to the dreary days is inspiring. I want to be a daffodil. In spite of the clouds around, I want to add color & hope to each & every day. Pansies have the same trait. They bloom amidst the snow & stay til it gets too warm. Kind of a promise of things to come. They arrive when we are so tired of gray days and yucky weather and tell us to "keep watching---the best is yet to come". And aren't they right? Soon all of the summer flowers and foliage will be in full bloom and we'll take for granted the beauty. We'll forget about the winter blahs, and fill our homes with the blooms that create such life. So right now--I"ll be a pansy or a daffodil and hope for the brighter, sunnier, more colorful days that are sure to arrive. It's Been A Month To Speak Of!!! I don't think I remembered to wish all of you happy new year!! So, happy new year! And what a year. It started off with a BIG BANG in our household. On Jan 8, hubby was taken by ambulance to the hospital, where he was first diagnosed with a TIA (look it up-too much explaining for me). But after an MRI, CT Scan, Angiogram, EKG, it was determined he had a full blown stroke. Yes, those were the technical words right from the Dr's mouth--full blown stroke. It happened in the cerebellum. Because he was in good physical health otherwise, he had no lingering side effects. After much testing (blood pressure/low, bad cholesterol/120, no plaque build-up), and no answers, he was given an ultrasound scope of his heart, and lo and behold---he had ASD. Now for all of you novice medical persons (of which I USED to be one) that means he had a hole in the upper chamber of his heart which allowed a blood clot to pass back into the blood stream. Apparently he is NOT the first to have this--??? (although you'd never know that by talking with him), he probably has had this since birth. It shows up later in life. So, the treatment was to have a GORE HELEX spiral occulater (aren't you impressed???) inserted to close the hole. The procedure was done like that of a stint insert--they go in both arteries in his legs with a camera and fishing line (not really) and insert a disc on both sides that closes via a wire run through the middle. Now he's back to "good as normal". But it did make for a scary time and alot of hospital visits! 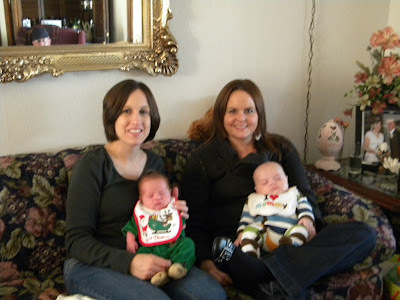 And, did I tell you that our little Mack (left hand side) was born Dec 3? He's Hank's brother and quite the little doll.. actually, he looks just like Hank at that age. I think they are going to be carbon copies!! Next to Mack is his second cousin, Jacob, born in Sept. The two girls are first cousins! On this side of the family there are 6 little ones under the age of 4! Second cousin, Daisy, was born Dec 21. Don't you know next Christmas will be a hoot and a holler!!! On to the next event---our son is getting married Jan 30. You guessed it---I'm preparing the reception food, cake, grooms cupcakes, and cookie favors!!! Glad I have a professional kitchen & employees to help with this!!! We just love his fiance--she's already become like our daughter! Just checking in---will talk more later. Yes, we had a white Christmas here in the heart of Oklahoma. It was the most beautiful day. And, we were home--that makes it even better. Unfortunately, my son's fiance couldn't make it to her home so they arrived on my doorstep Christmas Eve and stayed two nights. What a great present for us--we got to spend some real quality time with her before the January 30 wedding. We had no preconceptions of what to do this year--as the ice & snow cancelled many plans, we just sat back & let it happen. My parents, sister & her family live close (same town) so we had Christmas Eve dinner of potato soup & gourment grilled cheese sandwiches---yes, I said gourmet! Havarti cheese, cranberry chutney, avocado, red onion, turkey, ham, pepper jack, applewood smoked cheddar--your choice. They were so yummy! And, of course, chocolate & peanut butter fudge, rum cake, and sugar cookies. But wait! We didn't stop there! Christmas morning is the "annual" breakfast at the house--blueberry pancakes, bacon & eggs, smoothies, hot cocoa. Full as ticks you might think? No way--we continued with Christmas dinner at sis's! Chicken picatta, salad, steamed veggies, desserts--and on and on. No wonder I can't fit in the clothes! They opened presents -- which with a 3 year old is the best entertainment in the world! And we all got to hold Mack--who is 2 1/2 weeks old! All the local family returned and we played games and laughed and enjoyed the company of a loving family. So, I am really sorry for the ones who missed out on spending time with family due to inclement conditions, but it worked out so well for us. I just sat back and counted my blessings--which have been many this year. In a month we will have a new daughter-in-law & we couldn't love her more---couldn't have hand selected one we were more pleased with! And we have been blessed with 2 of the most wonderful grandsons! And they are so cute to boot. And so smart. And so --- well you get the idea---we are CRAZY about them. Many thanks to the good Lord for what He has given to us--and we are so undeserving. But so grateful. May His blessings multiply to you and yours in the New Year. Well hope one and all are settled in for a day of giving thanks--don't feel you have anything to give thanks for? Well, if you have to work on this day, you are one of the minority who have a job. If you are dreading spending the day arguing with family, well, you at least have a family to bicker with. If you are already feeling the calories attaching to your hips, stomachs, thighs, do I really need to explain this? If you are away from home, do you see the beauty of nature around? Is there a friend you can take a piece of pie to? Could you at least take a walk & be thankful you can walk??? I have so, so much to be thankful--mainly that I still live in the greatest nation in the world. That I have worked so hard today---doing what I have always loved to do--COOK for others. That I have a loving family--no, I didn't say perfect; how boring would that be?? That I have two additions coming to the family--little Mack Alexander the first week of December & precious Erin through marriage to my son on 1/30. There's nothing like a growing family. And we are excited about both! We begin another trail on our life's journey. I love this time of year--I'm thankful for the red, orange, crimson leaves that fell from the trees, the Christmas decorations that are going up on houses & businesses, the Charlie Brown special, the cool, crisp air that keeps us reminded of the cycle of life, so much more. Love the Norman Rockwell paintings of holidays. I like to imagine that's us---you just know that there are kids screaming in the background, mountains of dishes piled in the sink, burnt rolls on the counter, football games distracting men from our conversations--all of the "normality" of family life. Must run for now--laundry to finish, a house to straighten, you know, make the kids think I'm the perfect (ha ha) mom. I am also thankful for my blogging friends. I have neglected all of you so this past 6 months, but I still read in the wee hours of the morning, even tho my fingers are too tired to respond. Keep the posts coming dear ones---and have a blessed Thanksgiving!!! Here comes the Great Pumpkin--right down Pumpkin Lane. That just goes to show why we don't have Halloween Carols--they're too hard to pen! It's been a long, long time since I've had a few minutes to post. And will probably be a while before I do again. But, this being my fav time of year, and being I don't have much planned for the next few minutes, and being I have missed this soooo much---here I am!! My little pumpkin, Hank, is ill--he has flu & pneumonia. But, they started him on meds, and the Dr thought both were in the early stages, so he's home recovering. Just hate it when kids are ill. It's difficult to be pleasant when you are adult & ill---millions of times harder when you're only 3. And to this day, moms & dads don't get that. You have to become a yaya before it totally sinks in! Plans for Halloween? We have the annual Trunk or Treat here in town, and Friday is the Merchant's Costume Contest---I think we're going to participate this year--depends on the weather. That's right, I said the weather. We are planning to do something to the outside of the kitchen front & if it rains Wed & Thurs (as predicted) that could put the hiatus on that!!! I would like to take the time to carve some pumpkins--and by golly I just might. That's one of the things I miss most about having kids at Halloween--they keep you accountable for all the "traditions". Making costumes, baking cookies, carving pumpkins, fixing hot cocoa. All of those things that make this season so fun--yet are so easy to lay aside when no one is there to push the point. I think that's the reason we get old! We forget to have fun--to play--to create. And we become grouchy old blobs!!! So, get up off your tush & let's get to celebrating!!! Ok, I think I'll do some more decorating. Or maybe I'll go ahead & bake some cookies! Drove through a neighborhood last Friday evening that was really decked out--didn't have my camera!! boo hoo Sooooo I think I'll go back one evening this week & snap some shots!! Hope they don't report me!! I'll post them too!!! Have a good week all---and get to having some fun. 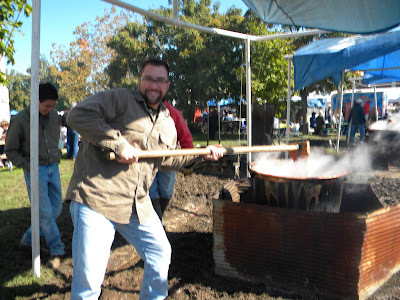 This is my son-in-law stirring the apple butter in town square at Mt Vernon MO. 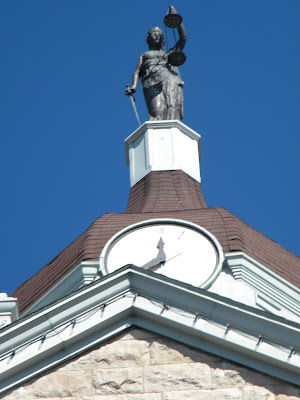 Courthouse steeple in Mt Vernon. 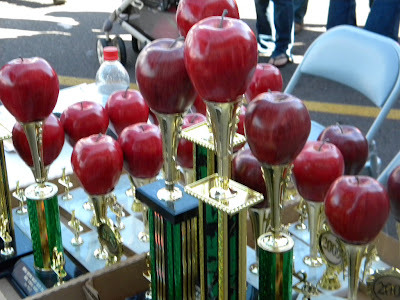 Apple Butter Making Days awards. Think these were "special order"???? And here we are--except Erin, who was taking the picture. Daughter, son-in-law, son, me, Hank, hubby. Yes we all loaded up (even my sis & her husband--I'll have to share more pics later) and drove to Mt Vernon MO a couple of weeks back for Apple Butter Making Days. This is a festival that has gone on for several decades. It's a BIG deal in Mt Vernon & over a 3 day time period, they have around 30,000 visitors--not too shabby for a town of around 4,000!!! Lots of crafts, talents, and food--lots and lots of food. Lots of apple butter! It sells out quickly so we got our case first! And it is delicious! Looks as if this will be our vacation this year. The economic fall hit us pretty hard, but we are recouping! Hubby finally found a job in June, and the catering is steady, so can't complain. We are determined to stick to our policy of not owing for anything-- no vacations, no big outlandish Christmas presents, no THINGS. It's quite freeing actually. We no longer assess our "wealth" by the things we aqcuire. We've become more focused on who we are than on what we have. And it feels pretty danged good! We now know to enjoy each & every moment regardless of where we are, we take time to visit with family rather than taking time to decide what we shall do! Time will come when we can visit the country, but right now, we are so very grateful for how God has blessed us. We have health, we have food, we have a roof over our heads. And today, of all days, that being blatantly shined in my face. I am on my way to a funeral--a girl I was raised with, her mother is one of my mother's best friends, we spent alot of time at their home growing up. She was 4 years younger than me, so we didn't "run around" with one another. But she was part of my background. And she passed away suddenly Thursday morning--died in her sleep. Makes me stop and take stock of what is important. And it sure ain't things!!! It's my kids, my family, my husband, my spiritual growth, untangible items that are eternal. And then the season of overeating!!! What more can a plump gal ask? Ok, enough rambling. Have a wonderful fall day!!! Just entered a new phase of my life!! After 16 years in the educational field, I am the owner of a catering business---a dream come true. I hate confrontation, love peaceful times, my family, my cat & dog, music, and BLING! !